Ceasefire is one of my all-time favorite cards. It's tremendously underrated, despite the fact that is IS restricted, for reasons people always seem to miss. First of all, it’s chainable. If your opponent tries to nuke it with MST or Heavy Storm, you can activate it and do a nice amount of damage. You can activate Ceasefire as long as there is either a face-down monster or a face-up effect monster on the field. Field full of effect monsters? 5000 damage. Granted, that doesn't happen very often; but after a Cyber Jar flip it isn't uncommon to do 2500-3000 damage all with Ceasefire. That's very likely to end games, and it has done so for me much more than once. The Flip Effect negation is really just a nice bonus. If your opponent sets something you really don't want to risk attacking, just activate Ceasefire. His Fiber Jar, Cyber Jar, or Magician of Faith is now utterly worthless AND he's just taken some damage. You can also use it as a preventative measure, to keep your opponent from using your Flip Effects. Did he Change of Heart that face-down Night Assailant and you really don't want him to use it? Ceasefire. Now he gets nothing...just damage. Ceasefire is, as I said before, tremendously underrated. 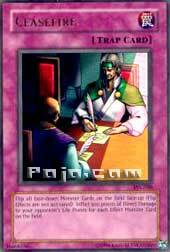 I consider it an absolute staple for any Burn deck, and I also feel it can fit well into just about any deck out there that wins due to LP reduction. If you've never played Ceasefire...do. The one Burn card no one really remembers anymore...but should. Ceasefire is definitely deserving of its restriction to 1 per deck. In early to mid game, it negates flips -- later on, it can usually do upwards of 2,000 damage. Many players ran this instead of a Nobleman if their deck had a tilt towards doing effect damage. This card has a lot going for it -- it's chainable, it can be activated without a face-down on the field if there's an effect monster, just to do the damage, and it stops that pesky Fiber Jar. This card really doesn't have much of a place in a non-Burn deck, as most of the damage is done through attacking and getting rid of face-down monsters and their effects is done through Magics (mainly the Nobleman mentioned earlier). However, this is one of the first things that should go into a burner -- quick damage to put an opponent on the defensive, or the last bit needed to end the game, just no reason not to. *Interesting fact: If a Scientist deck can't get its combo off to win, and it summons 3 Dark Flare Knights, having the 3 Dark Flares, the Scientist, and the Catapult on the field will make Ceasefire do at least 2500, giving the Scientist player some leeway in taking damage before getting off the combo. The final card of the underrated traps week I selected is a dandy from Pharaoh’s Servant, Ceasefire. Overlooked? Yes. Underplayed? Yes. Underrated? Indeed. But rightfully so? It is our goal to find out! Best Draw for the Situation: Fantastic late game because the damage can really destroy your opponent. In fact, it’s versatility makes it usable in all phases of play, simply because you can either deal damage at any time or stop flips when you have the advantage. Great trap. 8/10. Attributes/Effect: This is probably the best way to deal with flip effect monsters short of Nobleman of Crossout. I have a feeling that dealing with flip effects will be one of the most important aspects of the game in the post-ban environment; Ceasefire definitely deserves a high score for being so playable. 8.5/10. Dependability: Simple, you can either use it to remove flip effects (though you have to wait a turn) or you can use it to do damage. It’s great at both. 9/10. The Bottom Line: Highly playable. Cards it functions well with: It’s a one man wrecking crew. dawnyoshi Ceasefire was put on the major restricted list for a reason. It's very abusive. It's also been known as one of the most damaging trap cards to ever be released. In traditional format, this card easily suppresses many flip effect monsters, the most popular being Cyber Jar, Fiber Jar, and Magician of Faith. This is a great offensive card, negating flip effects and allowing your attackers to charge at your opponent without having to worry about your opponent's monster effects, unless it's something liek D.D Warrior Lady or Mystic Tomato. The damage this card deals is also pretty good. It's unfortunate this card doesn't see much play in traditional format. In the advanced format, burner and stall decks are going to be very popular. This card disrupts flip effects and can deal massive damage. It's a great burner card, which will make it very popular. In limited, this card deals very good damage considering the fact that you start at 4000 life points. Effect(s) : Ceasefire’s effect is both strategic (flipping Set Monsters face-up and negating any Flip Effects), and offensive (inflicting 500 damage per Effect Monster on the field). The only part of the effect that is one-sided is the damage: the player using Ceasefire takes none. Just to make this clear, since I seem to have to mention it ever time I go to a tournament, both players Set Monsters are flipped with their Flip Effects (and only Flip Effects) negated, and both players’ Effect Monsters in play contribute to the damage total. Separately, neither of these effects would be worth the effort, but together they seem pretty potent. All though highly improbable, you could activate Ceasefire to flip five of your opponent’s Flip Effect Monsters face-up without triggering said Flip Effects, while also having five (non-Flip Effect) Effect Monsters on your side of the field, inflicting 5000 damage to your opponent. Of course you can also get no damage out of it if no Effect Monsters are in play. Some relevant rulings for Ceasefire are as follows: if you chain this to a monster that was just Flip Summoned, the Flip Effect resolves as normal (Ceasefire didn’t flip it, so how could it negate it?). You need one of two conditions to activate Ceasefire: a face-down monster or a face-up effect monster. Monsters that are face-down but in ATK mode are not affected. Monster Tokens don’t count for this. Finally, if you flip a set Jinzo via Ceasefire, Ceasefire will resolve first. Uses and Combinations : You are usually doing good to have two Monsters total in play at once under the Traditional guidelines, though Advanced play does indeed see more Monsters in play at once. Both formats tend to favor Effect Monsters over non-Effect Monsters, since Konami is not smart enough to realize that if you have two Monsters of the same level and relevant stats, but one gets a beneficial effect, you’ll use the one with the effect. This means that, especially in Advanced play you can probably score an easy 1000 damage. That may pale when compared to Ring of Destruction, but remember you take no damage, and as long as one of the two provisions is met, it’s as chainable as anything else. A fun trick with this is if you set an Effect Monster (preferably non-Flip Effect), you can chain to Nobleman of Crossout to make it fizzle. If your first of three Night Assailants are set, you save them all from being removed, although the one in play will lose its Flip Effect. Of course, if it was a Witch of the Black Forest or a Mystic Tomato, you lost “the element of surprise”… that’s all. Traditional : 3.75/5-If you, like me, still haven’t gotten a Ring of Destruction (by the time it was a promo, I was broke), but have or can get this, it’s just one step removed in terms of game winning. Yeah, you’ll probably only get 500-1500 damage, but you also aren’t taking any damage. Advanced : 4/5-I strongly recommend you to run this here. With less removal, this can let you know what is “safe” to attack, and will likely get better damage. Also, you have heard the expression “fight fire with fire”… well one of the best counters to a burn deck is having a few burn cards of your own. That way, after say a Beatdown deck has gotten a good whack or two in, but has been locked down, you can still win. I am not saying to run this over Ring of Destruction, but rather with it. Now I am saying to run it over Magic Cylinder, since this is easier to chain. Why does that matter? It’s not chaining to avoid removal, but chaining to go for the win (burn is supposed to be big, right?). Of course, I am starting to think squeezing in all three is a good idea for most decks. This card may be the definition of “underrated Trap”. When I started playing Yu-Gi-Oh, I ran (and/or side-decked) a Just Desserts or two. Why? Every deck should have at least a little burn (and this was in the Starter deck only days). When Ceasefire came out, it was the bane of my existence until I got one-either they’d negate a clutch Cyber-Jar, often doing enough damage to kill me anyway.